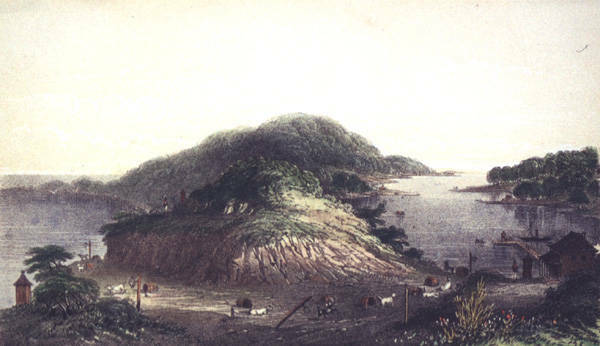 Following numerous escapes from the newly established Port Arthur Penal Station in the early 1830s, Governor Arthur ordered the stationing of sentries at the Eaglehawk Neck isthmus to prevent escapees from reaching the mainland of Tasmania. 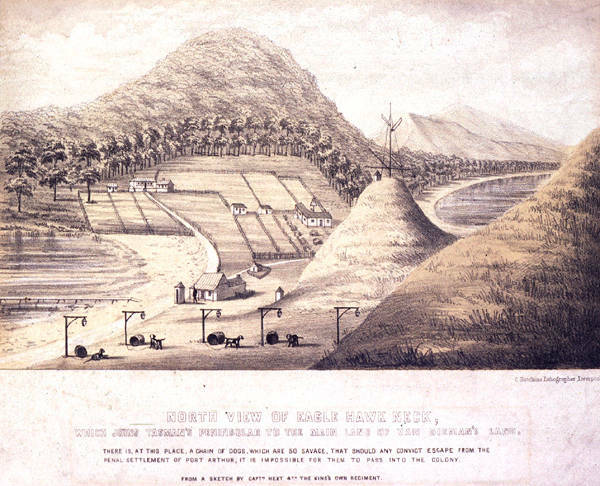 In 1832 an officer in charge, Ensign Peyton Jones of the 63rd Regiment, suggested that nine dogs and lamps lined up across the isthmus would provide an early warning system for the sentries. The initial idea was for the dogs to counter the noises of the sea and to alert the sentries to any activity. The first dogs were not particularly vicious. Nor were they particularly effective. In July 1834 Port Arthur's Commandant Booth visited the station and was 'rather disgusted' that he 'walked passed the dogs & found the Sentinel with his arms in the box'. Shortly afterwards the number of dogs was increased to 11, and later to 18. A variety of dogs was used in the line-up. Lempriere, the Commandant at Port Arthur, wrote that some were bloodhounds. The dogs were housed either in kennels made from barrels or in small huts and were constantly kept on chains. Behind the dogs was a line of four foot high lamps positioned so the sentries could see what was happening. There were also two or three platforms built out into the sea, to give warning of any convicts attempting to wade around the line. In the 1850s Port Arthur Commandant James Boyd wrote of the dogs: 'many of them have not been off the chain for years and are consequently very savage'. 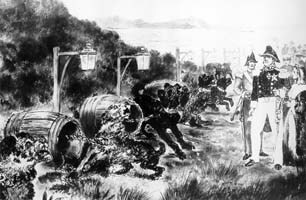 The dogs remained in use as an effective deterrent to escape by this route until the late 1870s when the Port Arthur penal settlement was closed. Further reading: I Brand, Port Arthur 1830–1877, West Moonah, 1975; and Penal Peninsula: Port Arthur and its outstations 1827–1898, Launceston, 1989; TJ Lempriere, The penal settlements of early Van Diemen's Land, Launceston, 1954, p 69; M Weidenhofer, Port Arthur, Melbourne, 1981.